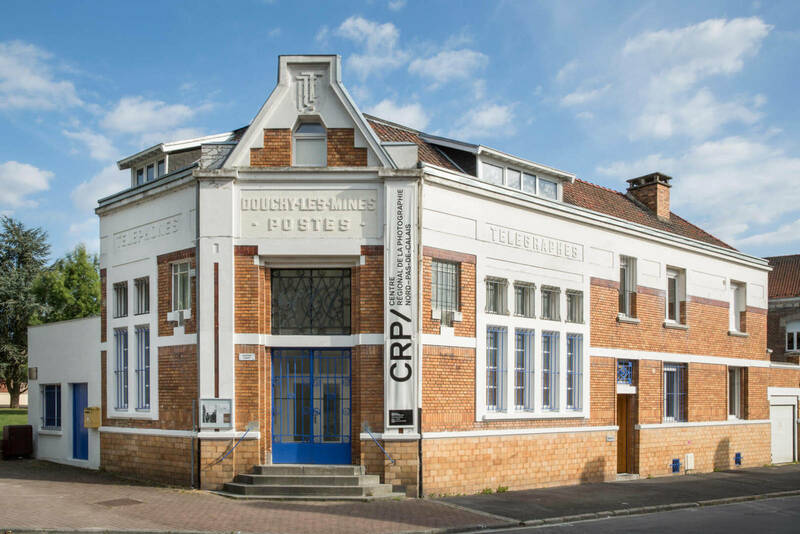 The CRP/ Centre régional de la photographie based in Douchy-les-Mines develops art centre missions in the field of photography and contemporary images. In the visual arts sphere, art centres are essential actors promoting the creation of contemporary art and its distribution in France and abroad. Their primary purpose is to support artists by helping them conduct research produce their works, and by transmitting and distributing this art research to the wider public, by means of innovative mediation tools. Founded in 1982, the CRP/ grew out of a collective of photographers who came from the photo club of the Usinor Denain Work Council. As a mobile association at the time, the CRP spent four years developing exhibitions and organising photography competitions. In 1983, in connection with its photographic commissions and its production of works, the Ministry of Culture recognised the CRP/’s art library, which became the first of its kind in France in the field of photography. In 1986, the CRP/ moved in to a former post office made available by the town of Douchy-les-Mines, and in 1991 the Ministry of Culture recognised it as a national art centre. Since it opened, there have been three successive directors: Pierre Devin (1986-2007), Pia Viewing (2007-2014) and Muriel Enjalran since June 2015. As a centre that supports creativity, at the outset it developed a project to commission works linked with its territory: the Mission Photographique Transmanche (1988 to 2006), which lay the foundations of its collection. This has since been supplemented through the art centre’s programme and productions. The CRP/ is one of the few art centres endowed with a collection directly linked to its own production activity. The CRP/ collection currently contains 9,000 works, with an art library offering the public over 300 works that may be borrowed. Linked to its significant publication activity, it also has a document collection of over 8000 books. The CRP/’s activities include creative support, research, production, distribution and mediation, all of which is developed in a region that is marked by its industrial past, an area that showed a very early commitment to culture. Today the CRP/ is a place of experience transmission, awareness-raising, mediation and training in the field of images, with a trans-regional and national reputation. The CRP/’s artistic and cultural vision, championed by its current director Muriel Enjalran, endeavours to be forward-looking, encouraging young artists through its research and support mission, keeping in mind the regional history of images to which its collection testifies. It is regionally rooted while also giving attention to other art scenes abroad, through invitations to artists who come and shift or renew visitors’ perceptions of their history and region, and provide access to other cultural and societal issues in the world. The CRP/ houses a documentation centre specialising in the field of photography and contemporary images, from their origins to today. Boasting 8000 references, this collection is made up of artist monographs, exhibition catalogues, artist books and portfolios, magazines and dictionaries. Some out-of-print publications that are important to the history of photography make this documentation centre an exceptional and quite unique site in France for artists and researchers, but also for enthusiasts who wish to access a broad range of references in this field. The CRP/ has a traditional print photography laboratory open to everyone. The CRP/ has a traditional print photography laboratory open to everyone. Amateurs and experienced photographers who would like to discover or dive back into the fundamentals of the practice of photography can access a workspace equipped with all the materials needed to produce traditional black and white prints. The enlargers on site make it possible to print 35-mm negatives up to 4×5 format. The laboratory is freely accessible when workshop sessions are not in progress, however users must have a basic knowledge of how to use the materials. Otherwise, introductory training will be necessary. The CRP/ has a stock of frames for various kinds of photographic framing, available to be borrowed. Douchy-les-Mines is located 10 km south of Valenciennes, at the centre of the Paris-Lille-Brussels triangle. By car: 40 min from Lille / 80 min from Brussels / 2 hr from Paris / 4 hr from London. Closed on December 26 2018 and January 1st and 2nd 2019 . During holidays, opening times remain unchanged. Become a sponsor of the CRP/ and support the development of its activities! If you are a company or foundation and wish to support the art centre and its activities while asserting a cultural position, become a sponsor of the CRP/! As a recognised public interest association, the CRP/ is authorised to receive sponsorship and can deliver tax receipts providing access to the significant tax benefits provided for by the law of 1 August 2003* on sponsorship. – exhibitions organised on your company’s premises, including works from the collection and the art library. – educational workshops for the staff of your company (suitable for all ages: adults, teens or children): these playful workshops offer creative training in photography and give you a fresh perspective on your everyday environment. *The tax reduction is 60% of the amount of your donation from your corporation tax revenue, up to 0,5% of your company’s turnover with the possibility of carrying over—if the threshold is exceeded—to the next five fiscal years (tax reduction for donation to artworks, cerfa no. 11580*02). ** Your company’s counterparties, in communication and public relations, are limited to a ceiling of 25% of the donation amount.